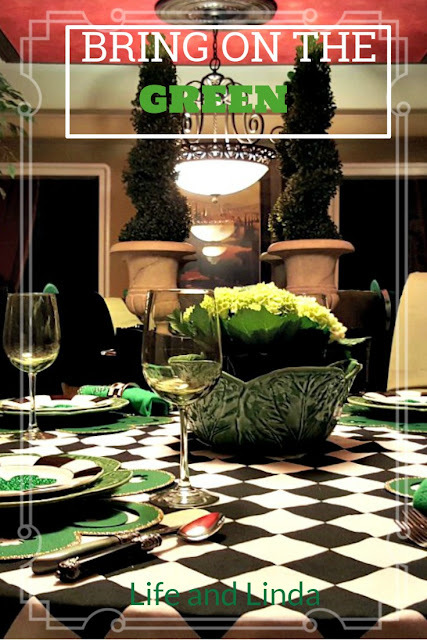 Home / clover / green / St. Patricks Day / tablescape / Bring On the Shamrocks! St Patrick's Day is so close. I am mixing up colors today. Gotta use green. I added the black and white for fun and interest. This tablecloth has come in handy for so many different looks. The blue hour is caught on camera again, in which I love. A great view off the Breakfast room. The green hats sit on each chair. Cute shamrock placemats from the good old dollar store. I also picked up a bag of shamrocks. The traditional cabbage plates are used once again. 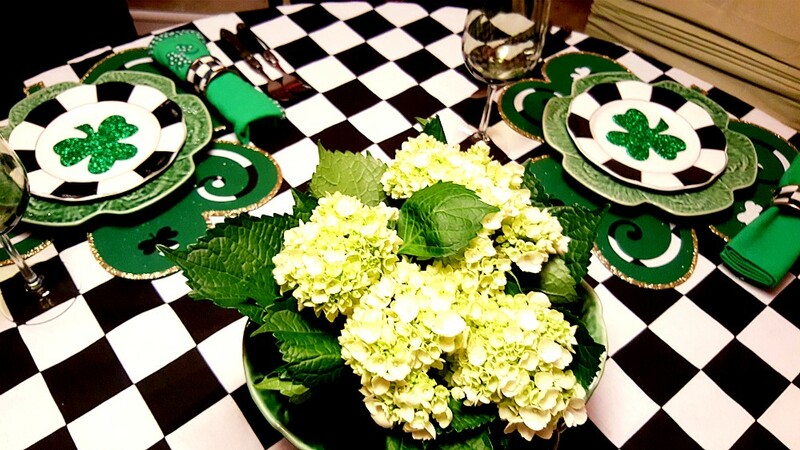 Green shamrock napkins are rolled up with the MacKenzie Child napkin rings. I alternated the green and black flatware for a different look. Pretty lime hydrangeas sit in the large cabbage bowl. 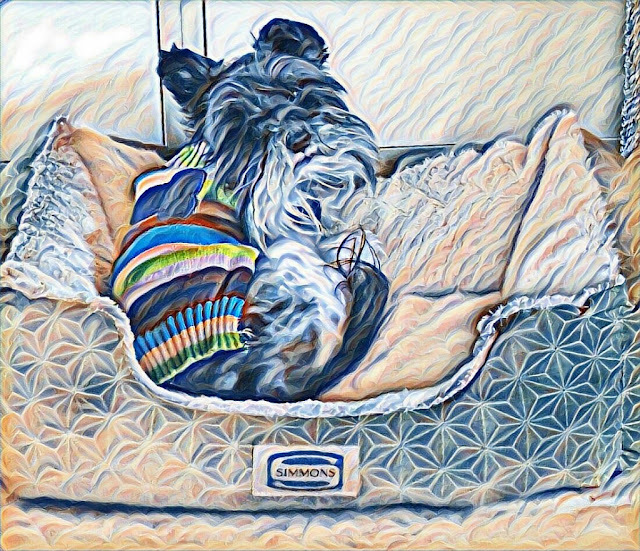 Dante our toy Schnauzer is doing well. He is on meds. So far he hasn't had a seizure since I started giving him the meds. Sharing a picture of a few of our daffodils. I have to plant more, so it will look nice and full. I hope to visit Daffodil Hill soon. 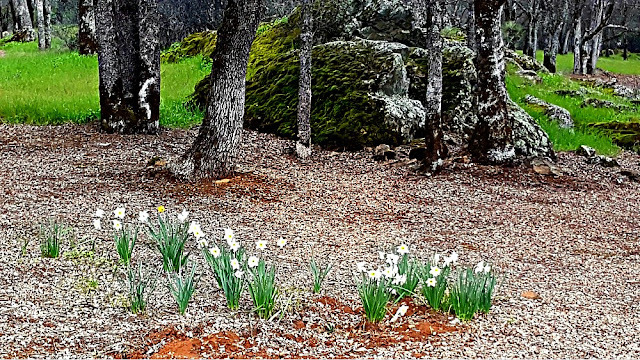 Unbelievable daffodils growing on hillsides. I hope your week is going smoothly. Hi Linda, dear friend, this table looks wonderful! You always celebrate in style, Linda. The table is lovely. Linda we were on the same page as far as thinking green, black and white. Love your St. Paddy's tablescape with the hats on the chairs. Your table is adorable! Hi Debbie, yes, we were definitely thinking the same with the black and white with green. Love your MacKenzie Child table. Great idea to mix the MC black and white with green. It is dramatic and striking. Very creative, Linda. Glad your Dante is better. Looks very festive for a great St. Patrick's Day celebration! You manage to out-do yourself with each new tablescape creation! So lovely and inviting! The black works great!! Glad about puppy..and the daffs are so fresh! Linda, what an adorable tablescape! 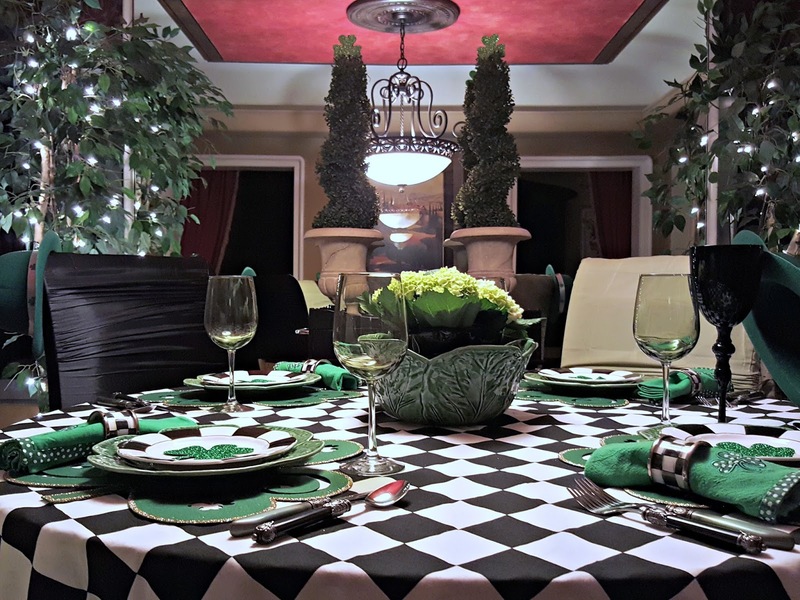 I love the black and white checked tablecloth! It looks great with all of the pretty green. I hope that you are enjoying your week!!! You have given me some good ideas Linda, thank you. While we are going out to celebrate St. Patrick's day, I may do cocktails with friends the day before. 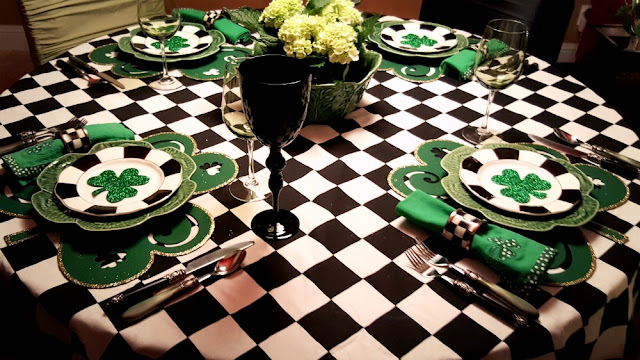 I think bright green shamrocks were made to go with black and white! It's wonderful Linda! Linda... Your table looks positively darling! And those placemats!! Hope you have a great week. Glad to hear your pup is doing better. It's SO appropriate to use the cabbage plates, given how prominently cabbage was in traditional Irish cooking! You never disappoint when I come here to your blog. It is always fun to visit you and I know I am going to see pretty and NOT hear political ranting (that is still happening on some blogs)...lol Onward we go, I say! What a cute table Linda. 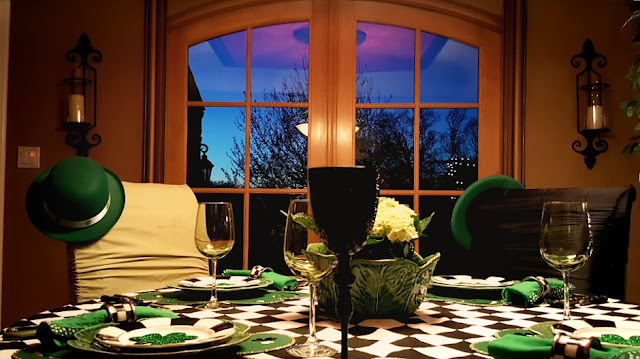 Love the hats on the chair with the blue hour- great picture! I like this look with the black and white tablecloth. 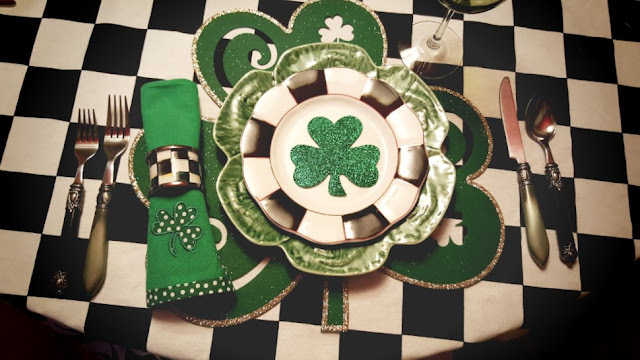 The shamrock placemats were a great find! So glad to know Dante is doing well with the medication now. I like seeing the daffodils naturalized- I should do that by the edge of the woods. Good thing is the deer and rabbits leave them alone! Beautiful tablescape Linda, love the black and white in there also. Glad your Dante is feeling better on his meds, it's always so hard when they are not feeling well. Take care. xo! Green is probably my favorite color (although I mostly use it through plants as far as décor goes) and I love how you paired it with black. March is often cold here so the display gives a nod to spring without feeling too summery. Happy March! Fabulous and welcoming! I hope a magical leprechaun stops by and brings you some extra good luck! Oh how pretty! I love the black and white with the green, perfect combo! 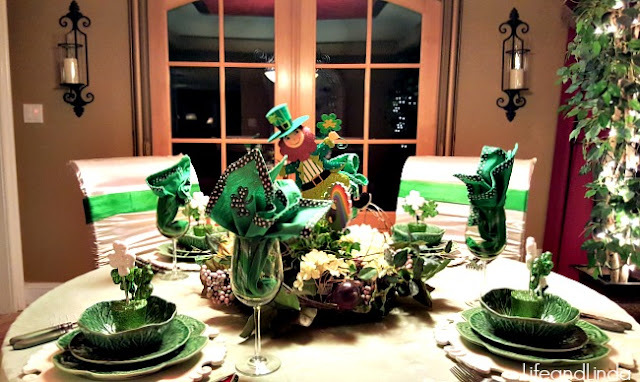 Your St. Patty's Day table is outstanding Linda! I love the black and white check with the greens!